So my father had a heart attack and I am now in North Carolina taking my stint as home health care for my folks. My father calls me the General but as my other sister is coming back this evening, he thinks he is going to have a Brigadier General and a Major General to now deal with. Things are going well at this point. But the reason for this post is that when I come, I get to see some old handwoven pieces I did years before and gave to my mother. I made this towel for my mother back when I finally was successful with Log Cabin. I do love this piece though I think I do see one mistake in it now. She has used it as a dresser cloth as she didn’t want to actually dry dishes with it and wear it out. I must say though I am in love with the 3D look of this and can never tire of looking at it. So then I found a bag I gave to mom. 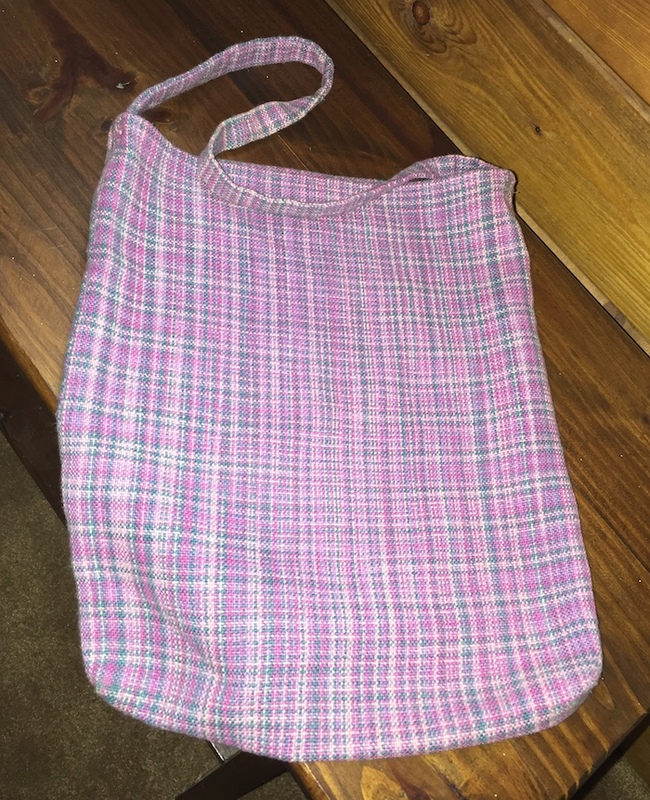 This bag is from the same warp as the bag I gave my new neighbor just a month ago. 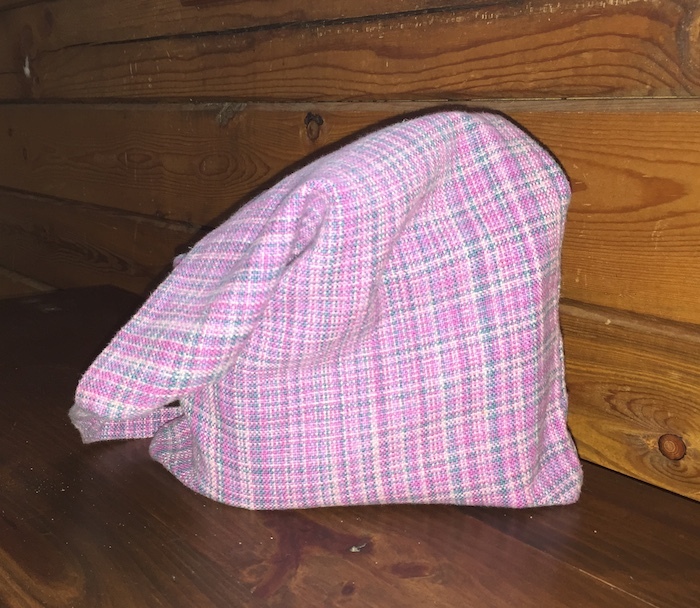 Mom has used this bag extensively to hold her clipboard with sheets of Sudoku puzzles as well as books when she is traveling. If you look close you can see it has had some life behind it. The straps really stand out. They are the same yarn as the warp but are inkle woven and so the colors aren’t washed out with a white weft yarn. Well, time to get back and see what is next. I think I need to go help with lunch now. We are moved alas my stuff is still basically in boxes awaiting its new home to be fixed up. A nightmare for my husband that I am taking pictures of and will have before and afters at some point. So little is being done in fiber except for one project that is taking time and needs to be done this week for its grand revealing. I so hope it comes round well and looks good. But more on that later for the memory bank. The day the movers unloaded our things here in our little piece of heaven, a lady stopped by and turned out to be our nearest neighbor to the east. We talked a bit and she left us her phone numbers and then invited us in a week to come to her daughters graduation party so we could meet people and other neighbors around. The day arrived and as neither my husband or I are good in crowds and especially ones we know no one in, we still debated going but decided we needed to venture out. Now I am not a natural at all with the abilities most have with such affairs, but I do know that it is proper to bring a gift. Though I also know what I like as gifts and think are nice most others wouldn’t. Yikes, what will we do? Not like I could just run to the store here unless you want something from Woodson’s Hardware and Lumber store or the Dollar store. So I went to my stash and pulled out this bag. In 2009, I attended my first Contemporary Handweavers of Texas conference in San Antonio. One of the classes I was taking was on weaving with space dyed yarns. Now you could bring yarns to class to work with but I had none at home. So getting in before my first class on Friday, I visited the vendors immediately. At the Lone Star Loom Room booth they had a clearance shelf and would you believe – three cones of space dyed yarns. I quickly bought all and had my yarn for class. (Sorry to any one wanting to buy before class that day but alas and alack.) I learned how to use them that day and came home and warped up the prettiest one. I love these colors and it came out so perfectly looking like a lot of hard work went into weaving this pattern. When actually all it took was keeping those weft bobbins in order and hoping you wound off enough for what you wanted to do. I did manage it. Yeah me! So back to this month. 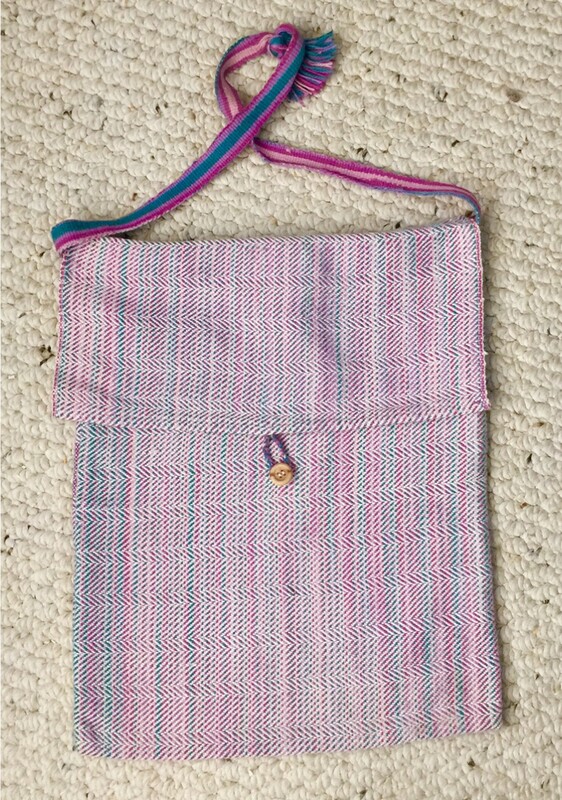 I found this bag I made with some of the warp and as I thought it looked nice, I used it for a gift bag. Then I added a mug and coaster that we got as an extra when we made a purchase that hadn’t been used – ever. If you are ever in my house, you will quickly learn that tea cups and mugs are not in short supply. So that went in the bag along with an unopened bag of tea and we had a gift. Not really a re-gifted gift and we didn’t go empty handed which I think as I understand etiquette would be worse than nothing. I am sure that she will never know that it was handwoven or that it was a favorite of mine that I let go. I just hope she thinks it is pretty, and that it is not her most hated colors. I guess this is actually a good week for this post as the Contemporary Handweavers of Texas Conference is back around again at the end of the week. In the wee hours of Friday morning, I will be headed out to my fourth one. OK, when my camera and I got together on Friday, I took pictures of several things so that lack of pictures didn’t make this a slow diary of my creations. So here is another one that is a story. I got some pretty yarn. Ok I did say pretty that pretty much was the end of it as I now know probably why it was on sale as it is pretty but not great to work with. At least not with triloom weaving. Can’t make a russian join to save its life. I had decided on a pattern of repetitions between the different colors that was to be very frequent and have a nice plaid look. Well this yarn refused to allow for easy almost invisible joins to take place. It was frustrating the repeats of color quickly became less and less. Do you notice something about this shawl? Usually when I use the triloom I end up with a piece that when taken off immediately settles into a size much smaller than the frame. I guess I tend to pull the strands way too tight though I so try not to. Well, this was to be three panels together to make a wonderful perfectly sized shawl. But guess what? You got it. Not a whit of the three shrunk in size when taken off the frame. So once they were all hooked together and a crochet edge crept around the entire piece, I ended up with the mother of all shawls. Shawl trying to look wonderfully draped. It will wrap three times around me. I can use it like those shawls you see where they do warp around and then tie in front so you don’t loose them while working. I know some ethnic groups (I am thinking Eastern European but don’t remember where I saw it at) knit shawls for that purpose and this so can be done that way. Tina hunting frogs and anoles. Now back to my picture efforts which did battle the sun. It was perfect when I started gathering stuff and heading outside but alas the sun did play hide and seek with the clouds that moved in, and so, we also played can we get good light now? All this time Tina ever the Yorkie hunter was out searching for whatever she could find that moves. In the end I think the best picture of the morning was with her. Tina in her favorite hunting grounds. While trying to get pictures of cards I turned and got her in her favorite hunting grounds. She actually has paths back there that she constantly travels when hunting outside. It seems like a sad day to write such a title but even as we remember 150 years ago and the Battle of Gettysburg beginning today, I have finally finished my miniature Lee’s Surrender. Here is original post. And no I don’t think we really know where this pattern received its name. I bought some beautiful variegated beads from Pat Powell Designs that matched this variegated thread almost perfectly. I then set about deciding what pattern to use. I decided to do this row of beads I saw as a base and then do the netted beads on that. It took me a bit to get a good hang of how to attach the beads but finally got it almost perfect on the second end. Having the row of beads on made it easy to get a perfect spacing for the netted beads. There are three beads between each point of the netting. It surprised me how green the green beads look in all the pictures. They are not so eye catching in reality. I am pretty happy with the piece and happy its edges finally got hemmed and fancified. I am loving adding beads to the edges of handwoven, just wish it was a bit quicker to do. But I found it a good excuse to just sit and watch Midsomer Murder as opposed to up and at it. To learn how to use my new-to-me loom, I put on a long green warp and then fiddled with different weaves on it. I started with some pretty nasty yarns (nice yarn but with this warp – yikes) first that just didn’t look good at all with it. Then I pulled out a cone of spaced dyed yarn that I had bought several years ago. It was the perfect match for the green of the warp. So away we went. 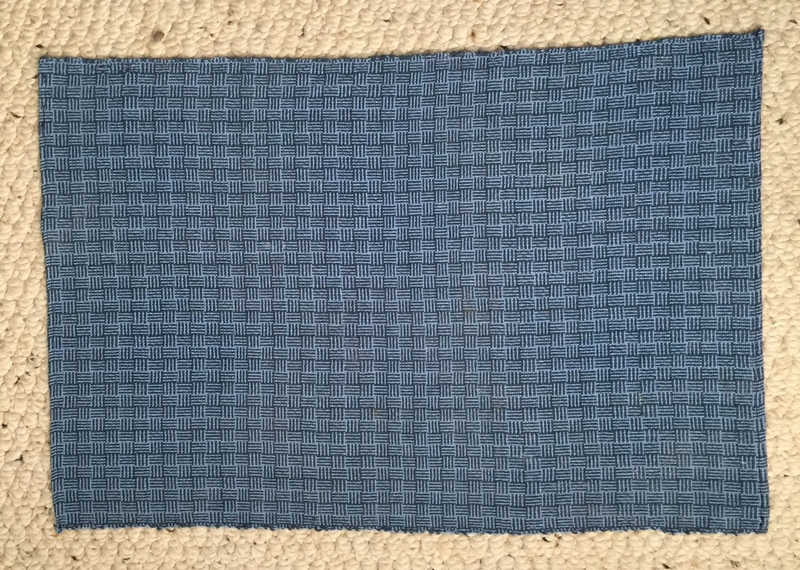 This towel I just wove with a twill, but to switch things up I got this great idea to switch the angle of the twill using a Fibonacci sequence. If you want to drive yourself insane, I highly recommend this activity. Lesson learned is that although it did give it a bit of a random switch back and forth. The lower numbers were not good to use. If I ever have an insane moment again, I will start with the number 8 or thereabouts. Starting with 1 and using 2 and 3 are only bound to make you doubt yourself. I first wound a multitude of bobbins (so it seemed but alas and alack I do not have a multitude so it really wasn’t) and kept them in order so that as I wove, the repeat of the pattern in the yarn would be kept and it would have a semblance of a set pattern. This towel showed it off well. I really love how the colors repeated in this towel and out of hundreds of pictures I took (OK, that may be evangelistically speaking, but it again seems like it.) this picture actually has the colors the closest to right. They really aren’t quite as washed out as the other picture looks (At least to me who has the towel here beside me in real life.) on the computer screen. Well, either I or WordPress are having troubles at the moment and the second towel picture won’t load, so I guess we will end with this one towel. I do love this one the best of all that came off this warp. Ok, this is going to be about a piece I wove a couple of years ago but the biggest hurdle this morning was just making sure I had spelled “iridescence” correctly. It turned out to not be what I came up with. I actually made it much more involved, something I have a knack of doing in a lot of things in life. So, I think it is spelled correctly now unless Wikipedia also can’t spell. But back to this piece of cloth. I had bought a self stripping cone of yarn that I loved the colors involved at the CHT conference in 2009 from Tracy Kaestner and the Lone Star Loom Room. I made a warp of it and then tried several different wefts and ideas with it. Interesting tidbits to then expand on. I won’t include all that came out of that warp at this time, but I did start my weaving by trying short bits of this and that and decided that I would do larger areas of most of this to see how it looked, but I wasn’t awed by the green and dark blue sections but I still thought they warranted a bit more to see what was really up in there. So I wove a bit more alternating light and dark green, finished the rest of the cloth, cut it off, washed it, cut up the different sections, and when it came to looking at the piece up close and on its own … I discovered that I really loved what happened and so wished I had done more with the green. The finished product was so much prettier than what I saw on the loom. The play of the light on this piece was just too much fun. I sat and moved it around and let the light fall from different angles and just loved the look of the the piece all around. The warp receded to the background but not so much that you couldn’t tell that there were different colors there. I had to do something with this little piece of cloth. It couldn’t just sit on a shelf being too little to amount to anything. So I went in search of something that needed it. Now I had a CD and book set that needed kept together. This became the perfect job for this bit of fabric. I made a pouch and inserted the set and now they never get lost from one another. I won’t say that I understand what is involved in iridescence or that I could actually plan a project on purpose, but I do dearly love this little bit of fabric that I accidentally created one day on my own.